Buy 3 boxes and save $30.00 over one box price. Boxes of 50 Cartridges: 8mm Lebel French Ordnance Revolver, or Model 1892 French Ordnance revolver. Newly made in 2016 using reload-able new brass cases and non-corrosive primers and 111 grain FMJ (Full Metal Jacket) projectile. 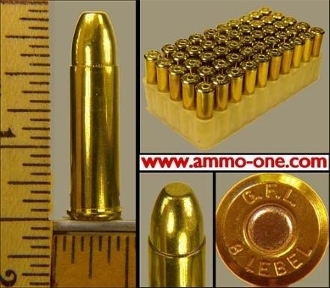 History of the 8mm Lebel French Ordnance Revolver Cartridge: The 8mm Lebel Revolver cartridge was introduced in France in 1892 for the double-action, 6 shot, French Ordnance 1892 Revolver.